Crate Mould is one of Zhilian mould company’s mould series, which includes bottle crate mould, industrial crate mould, fish crate mould, vegetable crate mould, bread crate mould, fruit crate mould and other plastic crate moulds. 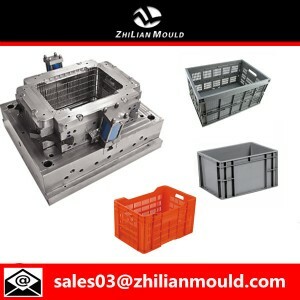 Zhilian mould’s 4 cavities crate mould design have been updated many times, it is suitable for high speed injection moulding, e.g. crate size 400*300*160mm, moldmax in the moulding area, the injection speed can approach 32 seconds. As a crate mould maker, Zhilian mould company is a custom plastic injection molding company based in the mould town of China with a wide variety of machines, so our custom plastic injection molding plant can handle most job requirements. Our plastics engineers and processors are familiar with many types of injection molding series including but not limited to: during the mould design, we will do a full analysis of the product structure and mould structure, which includes: the draft angle of ejection, the projection of pruduct ,the design of runner system, the design of venting system, the design of cooling system, etc. Plastic crate mould have strict requirements of cooling system, we need to consider the location and efficiency of the cooling system, and at the same time, we also need to consider it’s influence on the mould structure. We also need to decide the size of cooling system. Especially the cooling system aroud the cavity and core, as well as side cores, the design of cooling opponents and the selection of standard cooling parts. Zhilian mould company consider all these questions at the beginning of the mould design. Mould apply water circulation to every part of the mould, decrease cooling time. Promote productivity, cut costs.